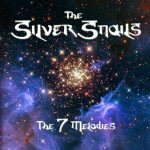 The Silver Snails aim to open hearts, a motivation that’s abundantly clear on their bright and colorful LP The 7 Melodies. The band’s Lucas Ward recently stopped by KGW’s Portland Today in Portland, Oregon, where he used the power of song to communicate the message of the music. Ward performed an acoustic version of album opener “Dancing With The Stars,” and he also participated in a wide-ranging interview. Watch it here. The album goes for NACC debuts this week.